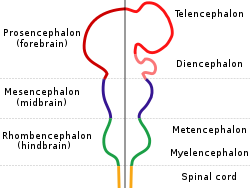 In the anatomy of the brain of vertebrates, the forebrain or prosencephalon is the rostral (forward-most) portion of the brain. The forebrain (prosencephalon), the midbrain (mesencephalon), and hindbrain (rhombencephalon) are the three primary brain vesicles during the early development of the nervous system. The forebrain controls body temperature, reproductive functions, eating, sleeping, and the display of emotions. At the five-vesicle stage, the forebrain separates into the diencephalon (thalamus, hypothalamus, subthalamus, epithalamus, and pretectum) and the telencephalon which develops into the cerebrum. The cerebrum consists of the cerebral cortex, underlying white matter, and the basal ganglia. By 5 weeks in utero, it is visible as a single portion toward the front of the fetus. At 8 weeks in utero, the forebrain splits into the left and right cerebral hemispheres. When the embryonic forebrain fails to divide the brain into two lobes, it results in a condition known as holoprosencephaly.